UPDATE: added four more photos! Here are photos from The Office episode, Junior Salesman, airing January 31. Well obviously Dwight is going to hold some sort of competition to see who will temporarily replace Jim. In picture 2, I think I can see Nate and Troy. And is that tall guy Gabe? Not sure who the fourth guy is. In picture #3, is that ‘Troy’ the guy who got Ryan on crack in season 4 & the guy who killed Jan in Threat Level Midnight?? 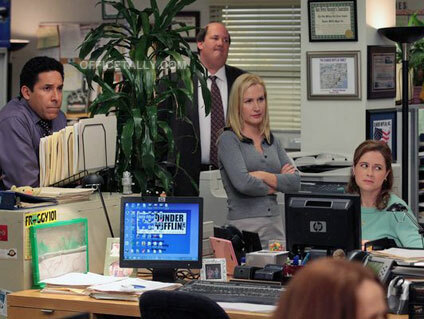 Love seeing Jim in the Scranton Office for a bit! Is that one guy in pic #3 Dwight’s sensei from the season 2 episode “The Fight”. That would an awesome callback! I think in photos 2 and 3 you can also see Dwight’s martial arts instructor as one of the candidates. Is that Dwight’s sensei from the dojo? I think the tall guy is Mose and in #3 is that Trevor? Really? Nobody’s talking about the fourth pic? What is the matter with this show’s writers? Honestly. I’ll just wait for this season to end up on Netflix, I guess. These last few episodes have been painful. OH GOD THE SARAN WRAP!!! dying. i am DYING. In photo #9, Jim totally has that “I don’t need this right now because I’m fighting with my wife” face. haha, it’s nice to see ryan’s friend troy back. I hope that the presence of Troy will serve to them make some mention of Ryan in some way. Looking forward to this episode. Pic #8 homage to MICHAEL!! !